It was very nice of the Atkinson Gallery to include two of my paintings, Nostalgia for the Body and Brain Dysfunction in their exhibition of work by selected MA and other Post Graduates. 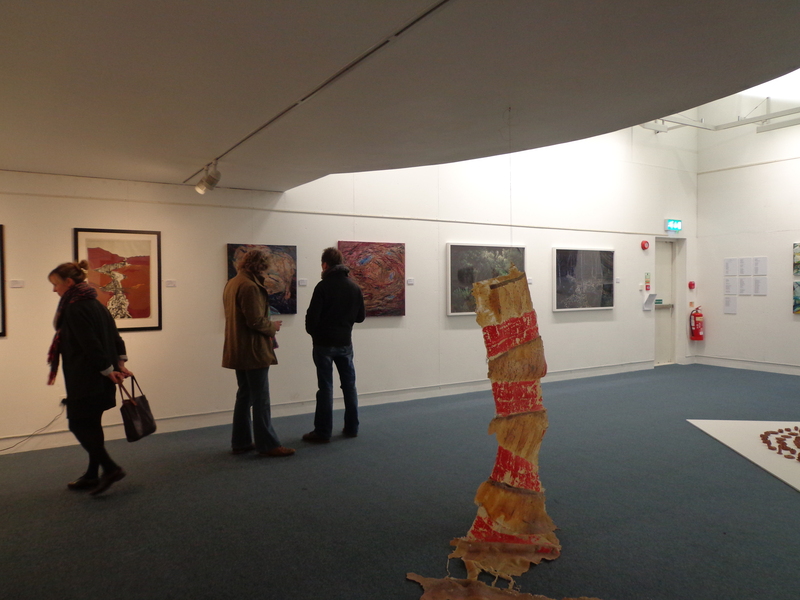 The Gallery is within the grounds of Millfield School in Somerset and has in the past shown work by an impressive range of artists, including Andy Warhol, Anthony Caro, Marc Quinn and Elizabeth Frink. The aim of the Post Graduate Exhibition is, according to the press release, to showcase “the work of students who express particularly fresh, innovative ideas and reflect the talent and wide range of work being produced in art schools today” So thank you. As I had never been to Glastonbury before, mud and blocked loos not having much appeal, I decided to go down for the Private View to see what fellow artists had done and at the same time visit the Abbey and stay at the George and Pilgrim which claims to be the most haunted hotel in England. Finding the Attkinson Gallery itself without psychic help proved quite a challenge and if Andy Warhol et al ever made it there, it just goes to show what a resourceful lot artists are; the signage is non-existent, and even some of the school kids seemed unsure where it was. I would still be wandering the grounds had not a very nice lady in reception come to my aid and took me there despite having no coat and it being a cold night. Once inside, I desisted muttering about signage as I thought the works that had been chosen were genuinely interesting and I was pleased to be part of it. Here are some of the works which appealed to me. I particularly liked the latex steps by Caroline Pick which you can see above. Caroline is a fellow MA student at Brighton and I featured her work last year in the MA Exhibition . 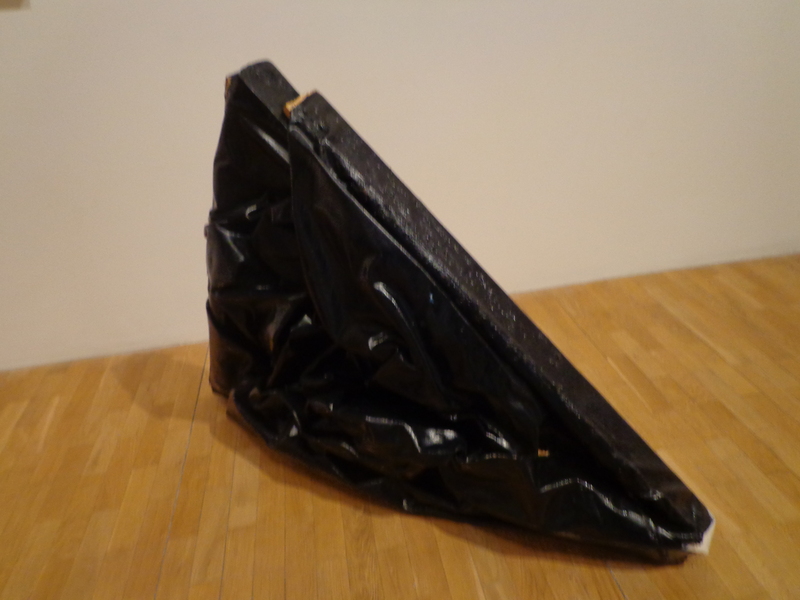 It was also good to see this work by Paul Tuppeny, Wing and a Bag. Paul is also taking an MA in Fine Art at Brighton. 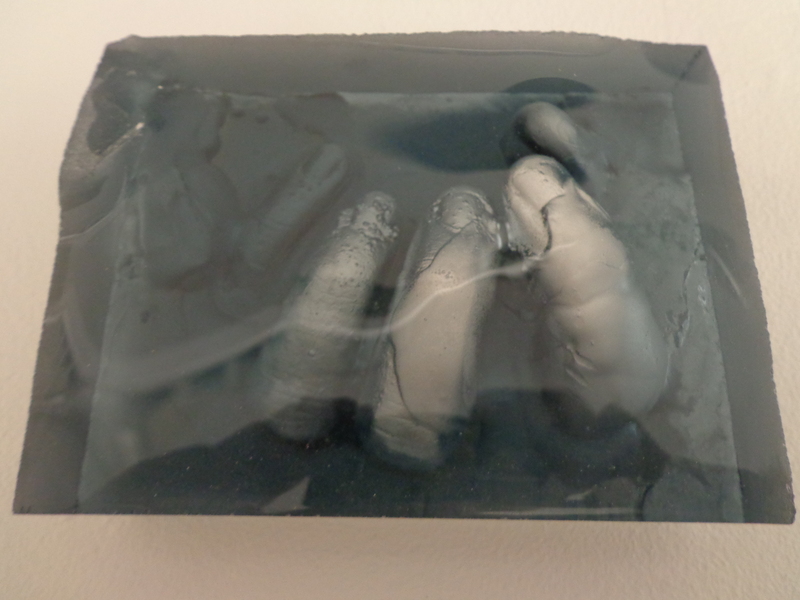 With this piece there is a satisfying contrast between its appearance, which resembles a cellophane bag, and its actual solidity. 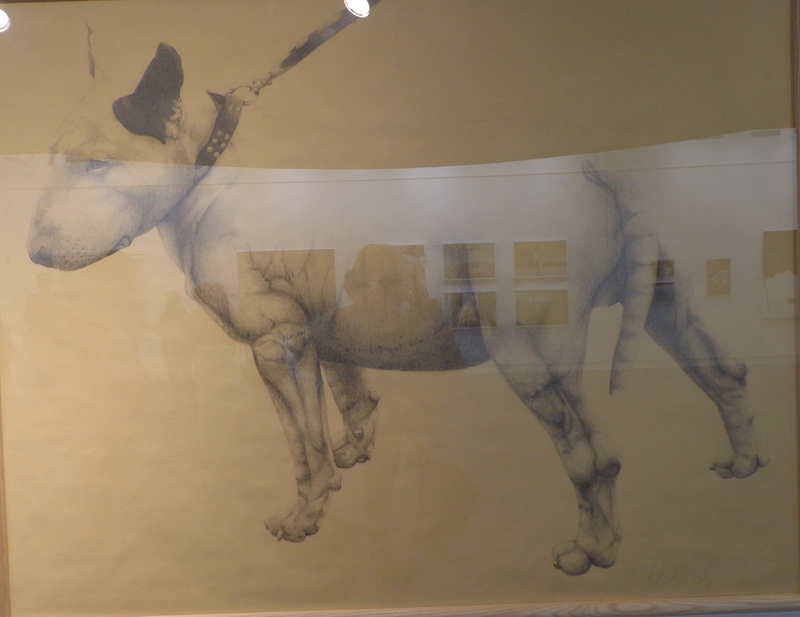 and was also impressed by the draftsmanship in Kathryn Poole’s lithograph Trachyphyllia Macrosoma, The bright light in the top middle left is a reflection and unfortunately the reflections in the photograph also stop you fully seeing the cleverness of Garry Wiggins superb drawing of a bulldog,. 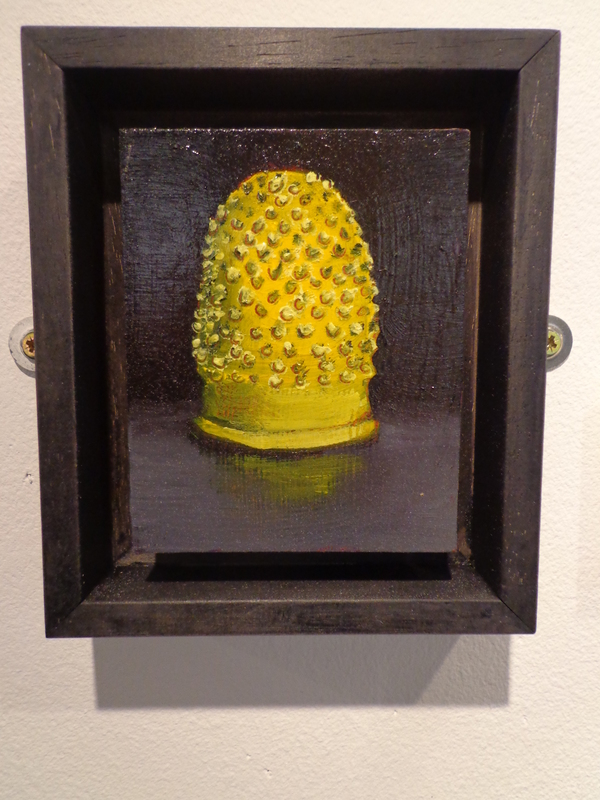 I am a great fan of Tori Day’s tiny paintings of everyday objects. This one Finger Thing is only 12.5cm x 11cm; not only is it beautiful in itself but it makes you look round you at other overlooked objects. Talking of spookiness, to my disappointment I did not see any severed hands or floating forms at the George and Pilgrim. Well, perhaps I didn’t really want to see severed hands. But while at dinner in the hotel my mobile did send a text to my daughter without any intervention from me, I can now report that ghosties use the rather over jolly way of speaking favoured by IT technicians. “cant talk now – what’s up,” it said. Now, if it had managed it in Shakespearean English, or, even better, had done it earlier and sent me a handy map of Millfield School, I would have been well impressed. “You can sell anything – you can sell Damien Hirst dots; you can sell a duck; it’s just a matter of finding the right market” so said a chap called Toby or possibly Tony who described himself as the proprietor of the Brick Lane Gallery. He became suddenly shy about giving me his name when he found out I wrote a blog, explaining that he had had so much bad press on the internet. It’s true: google Brick Lane Gallery and you will find tons of indignant artists who point out that Brick Lane charges artists for showing their work. In other words, it is a vanity gallery. I was there because somebody I knew from the University of Brighton had invited me and as I was curious about what sort of place it would turn out to be, I went along for the private view. Unfortunately, my friend had left by the time I got there but the artists who were still around seemed pretty satisfied with the service they were getting. 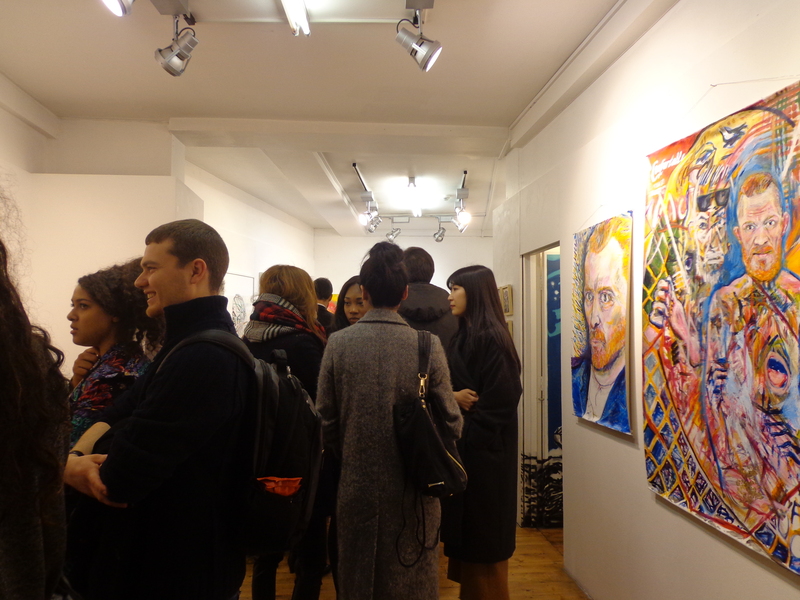 The Gallery is well situated, the paintings were well displayed and the organisers certainly know how to put on a party as the place was crowded with young people. if. as I suspect, not many of them were buying, that probably goes for lots of private views. There was also a bloke who described himself as an international journalist. Really? The first thing to say about the art is that it stood up reasonably well: it looked contemporary. Though there was nothing there that I would classify as outstanding, it was above the normal provincial village hall art show, so clearly some sort of selection procedure had been going on. As you might expect, some were decidedly better than others and there were a couple I thought veered towards the awful, but I have seen that in conventional galleries as well. 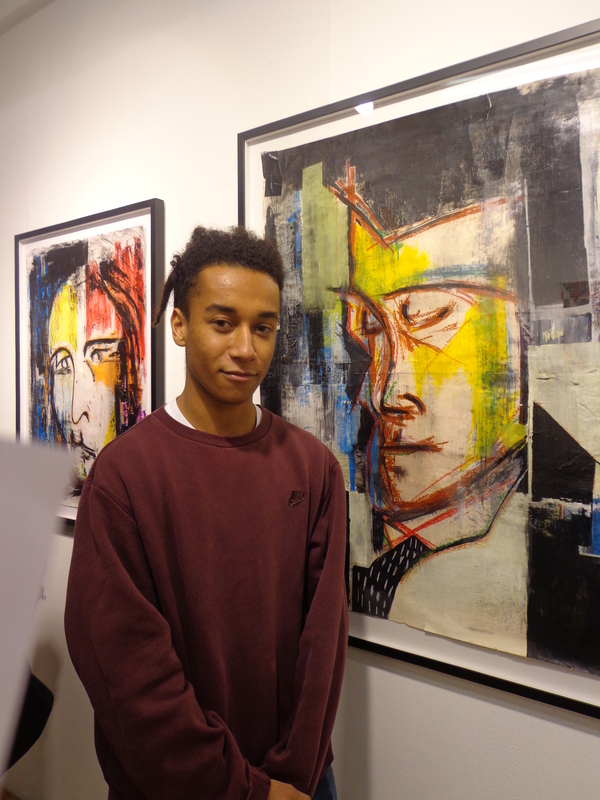 Some of the artists I thought distinctly promising; I particularly liked these paintings by CREO who is only 19. Toby/Tony reckoned that they rejected about 40% of those who applied. The way it works is that you can either rent the whole gallery at somewhere around £2,500 a week, and he says some artists do so frequently, or apply to pay for some wall space – about £500. 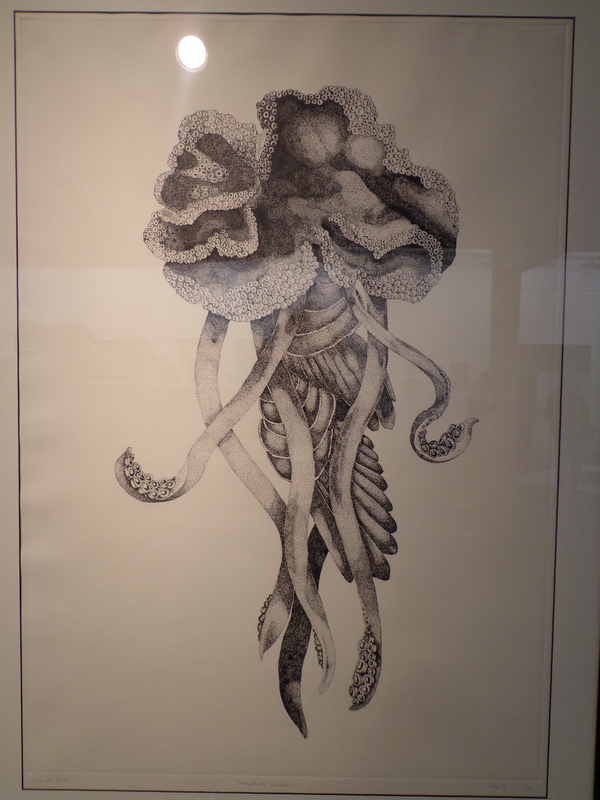 The gallery organises exhibitions around themes. This week it was portraits. So is it worth it? 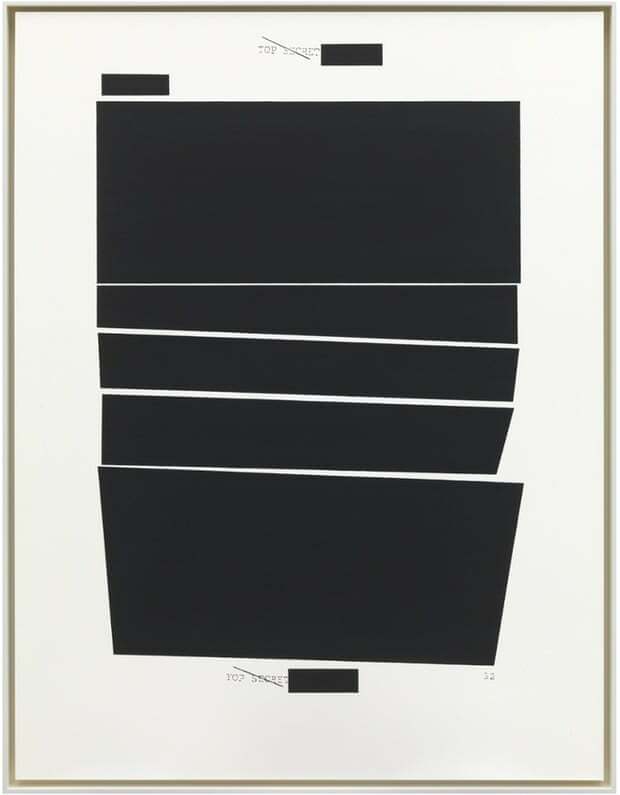 When pressed, T/T reckoned that somewhere approaching 40% managed to break even though he claimed that somebody recently had sold £7,000 worth of stuff and that another had been offered three exhibitions as a result. But he was keen to stress that it wasn’t about selling – more about experience. Really, I cannot tell you the number of times that someone over the past couple years has said to me in a vaguely sanctimonious tone, “I’m not interested in selling.” There is even one chap on the MA course, (Hello Cliff) who expounds the view that artists should not charge and art should be free. This is all fine and dandy but artists have to live, and canvas, paint, clay, stone, plaster, tools, transport etc all cost money, often a lot of money. So there are choices: either artists have a day job, or a private income, which subsides their art, or they manage to persuade the Arts Council or similar to pay them a fee and people get to see it for free, or they sell their art just like any other product. The traditional way is to get galleries to accept your work and they take a commission, but not everybody can find one, Or you can enter competitions – that tends to cost money too – but not everybody will get anywhere with those either, or you can try to sell on line and perhaps get lost in the crowd, or hire a room of some kind and organise your own show. That can be expensive in itself. This is where galleries like Brick Lane offer a real service: they take the hard work of organising an exhibition off your hands. Where I think they can be at fault is in suggesting to people that there is kudos in being selected. That is even worse if it leads artists to get involved in significant shipping costs. Having an exhibition at the Brick Lane Gallery or any other pay-to-be-in will fail to impress anybody who has any knowledge of the art world. But such galleries are not the same as vanity publishing which gives authors a hard copy of their oeuvre but leaves them to do the selling. The vanity gallery is more like self-publishing on Amazon which for the very, very lucky few can lead to fame and fortune. I visited the exhibition on a day when 50 Shades of Grey, the ultimate rags to riches self-publishing success story, was being advertised on buses.. Meanwhile, the people going up and down Brick Lane, possibly thinking of buying a painting, will have few thoughts of how the gallery makes its money and I would guess are just as likely to buy a painting from there as from anywhere else. Would I buy a painting from Brick Lane? Yes, if I liked it enough, of course I would. The prices were generally very reasonable. I certainly don’t rule out the possibility that you could find something really good there. Would I try to sell there? Well, I might be tempted if I were producing some work which I knew to have public appeal, some ducks perhaps, and I thought I could make a profit. Despite T/T’s views,that would be my sole criterion. But if I were part of a group show there, I probably wouldn’t put it on my CV. For a recent seminar on my MA course we were all asked to think of a question about contemporary art today and to bring in an image that was relevant to that question. Mine was “whether originality was still possible or whether everything had been done”. It was not so much that I believed that originality was a thing of the past, but I thought it worth debating whether the emphasis on novelty in art itself became a constraint. My image was a screenshot of the chaps below; who together make up Azorro, a Polish artists’ collective. In their video, made in 2003, and which I only just discovered by chance, the four of them decide that they must come up with a new idea. 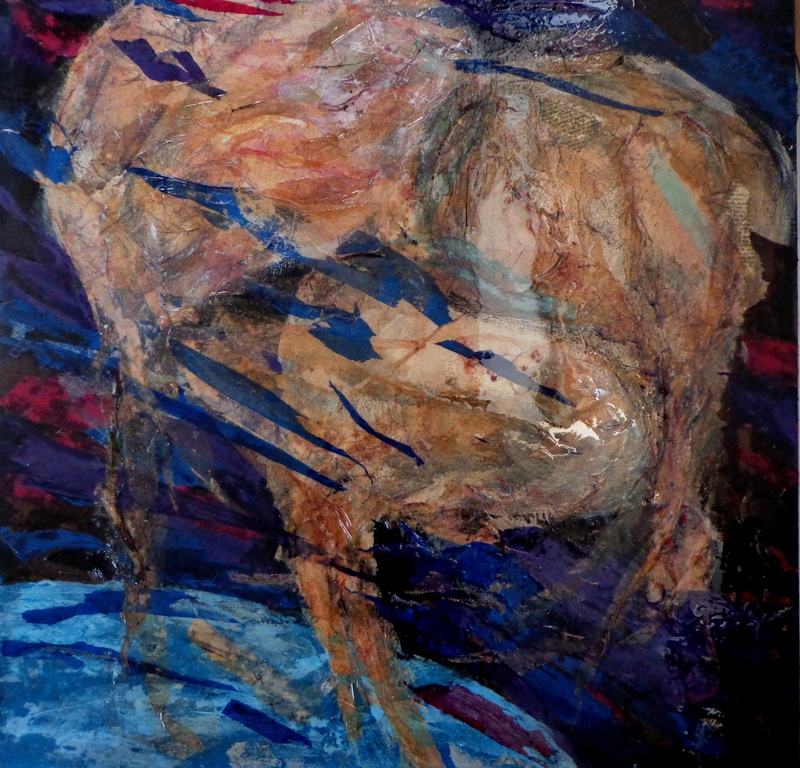 They start off suggesting a horse, rapidly move on “to a square with some kind of background”, and keep coming up with ideas that become progressively more outlandish, but each time they decide that it has already been done. It is comical and their timing is perfect but what is really brilliant about this short film is, that having had the first conversation, they discuss the subject again in a different location. Of course, the second time it had been done already – by them. 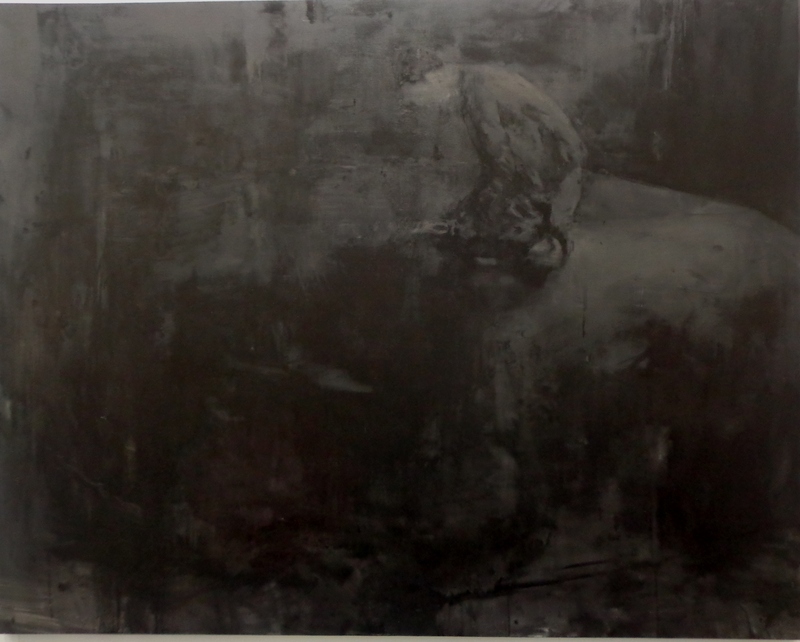 It was originally shown on twin screens at the Raster Gallery in Warsaw. It is well worth a watch. Unexpectedly I got the definitive answer to the question Has it all been done rather sooner than I expected. 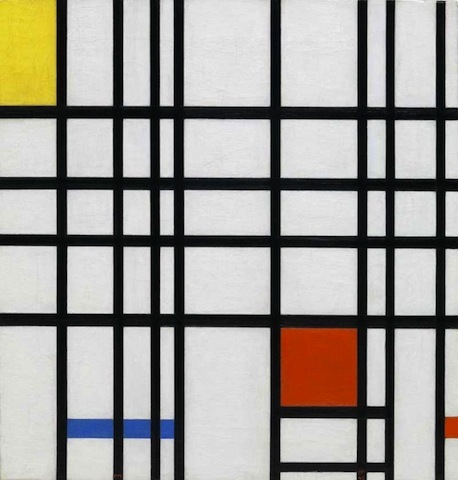 It was at the Whitechapel Art Gallery exhibition Adventures of the Black Square, which didn’t sound wholly promising but which turned out to be unexpectedly inventive and enjoyable. 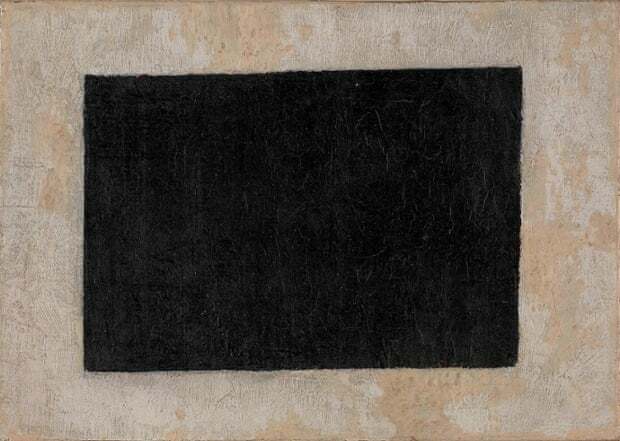 The exhibition takes as its reference Malevich’s famous black square, though to be precise it is his rectangle that they are showing; the square is presumably having a breather after its recent spell at the Tate.